One of the great advantages of our new Popup Builder is that you can apply any Elementor widget that you like inside the popup, and create unique functionalities. 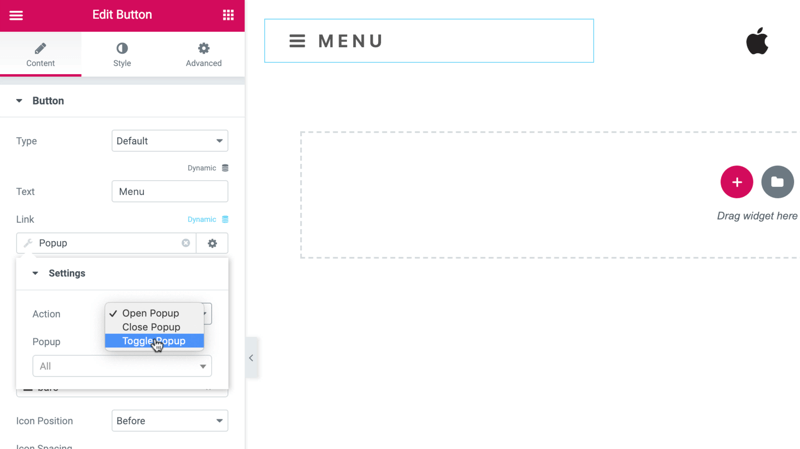 This is exactly what this tutorial will demonstrate – creating a menu that triggers popups! The menu is triggered when the user clicks on the hamburger icon. 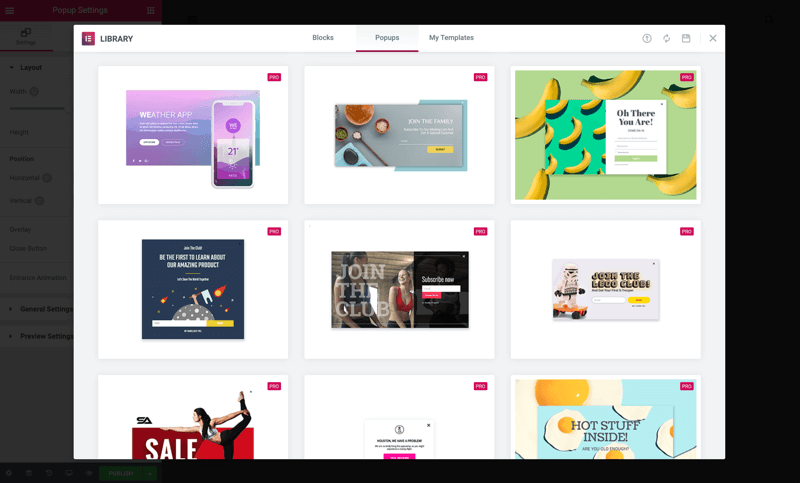 This tutorial is just the tip of the iceberg in terms of what can be accomplished following the same steps: menus with forms, images, sliders and more. Alright, let’s see how the magic is done. In the dashboard, click on Templates > Add New and choose Popup. Name it and click Create Template. Then you’ll get the view of our library (with more than a 100 popups to choose from), but close it so you can create it from scratch. In the Popup Settings, change the width of the popup. Switch Overlay to Hide, and under Entrance Animation choose Fade In. Set its duration to 2 seconds. Under Style you can design the Box Shadow settings. Under Close Button set the vertical position, and change the color & size. In the Advanced tab, choose Prevent Closing on Overlay. This sets where you can close the popup – Either on any part of the screen or only on the X or the button. Add a section with 2 columns. Under Columns Gap choose No Gap. Inside the left column, drag in an Inner Section widget and add some padding. 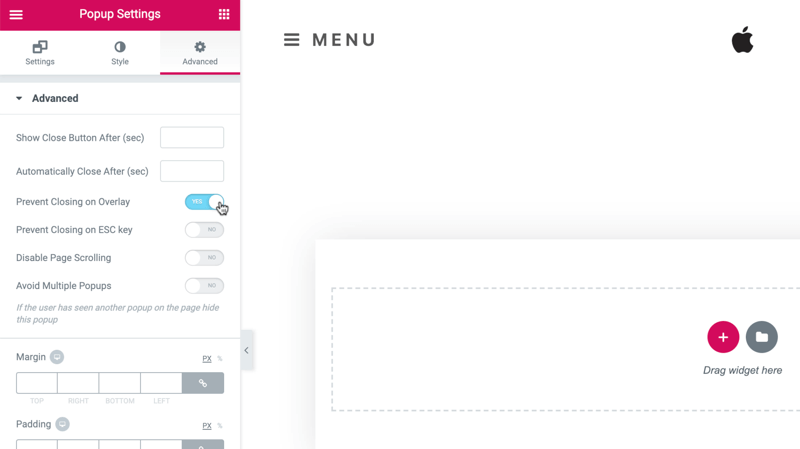 Drop in a Title widget and adjust your typography & size. This time start off with mobile, so that later you can duplicate it, and it will already be all set. Note: Here we are not using the Nav Menu, just the Title to create the menu. Add a button widget, and edit the button’s text and style, color, border, etc. Next, add a margin on the top, also in mobile. Tweak the text size, bottom padding, etc. Now, add another Inner Section and add some padding. Then, inside the Inner section add and design the share buttons – Alignment, size, custom color. In the right column, the color is changed, but it is only visible once content is added. Add an inner section, and adjust the padding & margin. 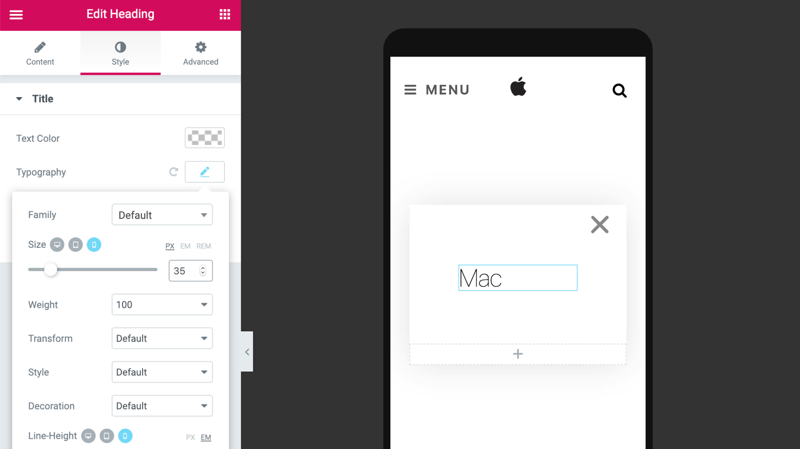 Drag in a Title widget and design it. 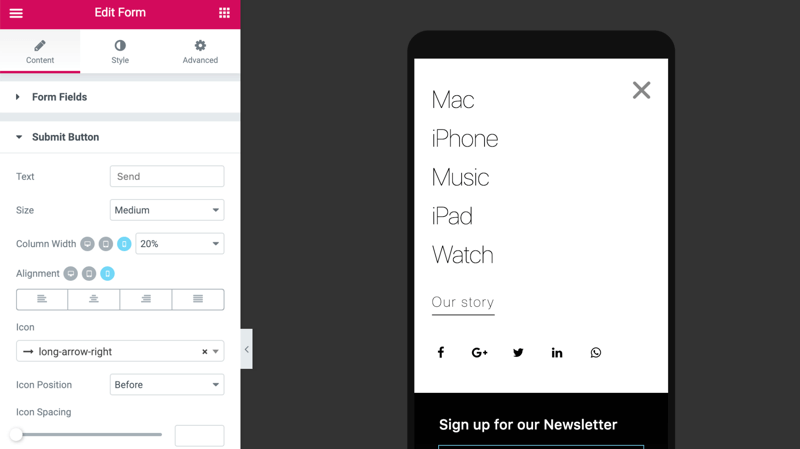 Now, add a Form widget for users to sign up for the newsletter. We just need their email, so let’s delete all the other fields, and fine-tune the size, icon, color, etc. To display 3 products add another Inner Section widget, add padding, but here, slide Hide for mobile to make it visible only on desktop & tablet. Here, a minus margin will shift your column to the left, making it stand out more. Copy the title and paste it. Change the column color to white, border radius & box shadow, also on hover. Drag in an image and there you go. Now, go back to the text and change its weight, margin and duplicate it. Edit the text. Then, duplicate the column three times and change each individual margin, to create a space between the columns. Add a photo. Notice you can use video, gifs or regular images. Polish your text and set the margins. Use the Preview mode to check how it looks. Now, design all your items for mobile, adjust the padding. In Settings, under Width, increase the VH size to 100, so that the popup fits the entire screen. Click Publish and the conditions window will open. This time, no changes are needed to the Conditions, Triggers, and Advanced Rules – This only applies to popups that are triggered by buttons. Then save and close. Now, let’s define how to open your popup by going to your site’s Header. Press the button Menu and in Content > Link > Dynamic choose Popup. Click again on Popup and under action choose Toggle Popup to make the button to both open and close the popup. In Popup, choose your popup and save. You can test it on your live page by clicking on the button to open & close the popup, and that’s it! Here’s a chance to learn another trick – Add some entrance animation to add some spice. Copy these settings to paste the style for each one. Back to the live page. Click the button menu. As this tutorial demonstrates, you can open popups from any kind of button on your page. This option enables you to be creative and explore new popup applications. Go ahead, give it a spin! Wow, that final design actually looks pretty impressive. Great post! I love Elementor, we use Elementor on every Page. I just domt know howi can Insert Script to Trigger on Icon clicks…. I have used Elementor before, and am thinking about changing some of my Google Sites over to Word Press. Thanks for this post! I am so glad a friend of mine introduced me to Elementor. In my humble opinion, it is easily the best theme/builder out there! Thanks for all the cool tips! We use Elementor in our agency after having switched from BB. It is far simpler to build out amazing websites. Thanks for making our job simpler!! could you share the file for us to import in. Question: Does this menu type create any page load issues? I moved away from a great looking mega menu because it affected my load time. It shouldn’t affect your page load time. You can use a page speed tool online and compare. If there is any impact, please let us know. What would this do to your SEO and web crawlers? Also, would this work well on older browsers or browsers without JS enabled? Had the same thought re: SEO & popups; I read that popups hurt your index score? Especially if you have many..is this true even if it is a non advert popup? Popups with button triggers shouldn’t necessarily hurt your score. It’s typically the intrusive popups that are the problem. My bigger concern with this menu system (I haven’t built one with Elementor yet) is whether the source code will be properly structured. If anyone has a demo with this already built, that would be useful to go into and view. My thoughts exactly. 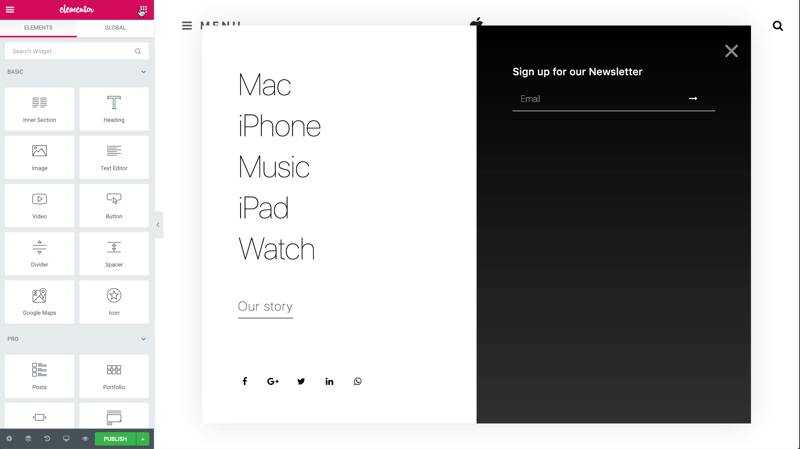 The video even calls out “not” using a nav, rather headings to build the menu. I have a use case where the client wants a fullscreen megamenu takeover, but I need this to be semantically correct for an HTML nav. What are the implications here? Could you add a hidden nav for SEO purposes and use the pop up nav for the user? Would that work? What the video didn’t show was which animation was used for when the iPad and iPhone boxes came from behind the MacBook one. You guys rule! Keep up the innovation! Great timing! The current menu structure I’m using is not working … but this new pop up menu might do the trick! Is there a demo site where we can actually see this menu live? This is SUPER legit – never thought of using the popup builder for this purpose but it works well! Is there a way to kinda darken the screen behind the popup – kinda like a lightbox background? This is so cool. Great work. Great video! Can I somehow animate the hamburger menu icon on click? I need a smooth transition from hamburger to close button. i dont have pop up as an option? How can I create a blog post template which included a featured video in top of the blog post? That would be a cool thing to find out. Like Aurora, POPUP isn’t listed as one of my template options. I selected it under Elementor>Settings, but it still isn’t a template option. Can you help with this? What are the search indexing implications if I put my menus inside of the popup, and use a hamburger trigger? So, instead of the header template with a nav inside, I’d have a header with a hamburger which triggers a megamenu style pop-up with my navs. I’m wondering if the schema will work out properly – especially for rich search results. I think I’ll put a mobile version of the nav in the actual header and hide it on all screen sizes except mobile. Then, on mobile, I’ll hide the pop up. This would allow me to place the full, semantic nav structure in the header and — hopefully — use a schema plugin to help Google understand. Plus, use a site map. Not sure if this works for the markup, but I’ll try it. These pop-ups are so nice. While this is a wonderful idea to use an existing feature in a creative new way, it really doesn’t replace the functionality of a “mega menu”, as the bold title of the newsletter that promoted this post suggested. A mega menu is highly needed and should have functionalities that the pop-up just doesn’t and probably shouldn’t have. The tutorial is the only one that the instructor keeps saying Ect. and goes so fast through the info it’s very hard to follow. The product looks great. The tutorial not so much. Great-looking menu/popup. But what happens if users have popup blockers enabled? Popup blockers deal browser popups, not HTML popups. So it should not affect a menu popup. Awesome way to make a menu, except I do not have the option to create popups? Thought this was included in my pro subscription? And yes – I have the latest version of the plugin? Hi Bart, did you check this guide? Brilliant idea! why I didn’t think about it before? gorgeus design btw!